In celebration of the tour launch, check out the brand new, massive 360 lyric video for the track "Hell To Pay" below. Special guests 9ELECTRIC also released their debut album, The Damaged Ones, this past summer. 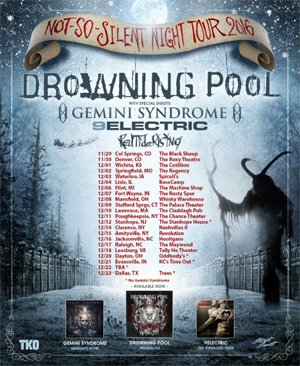 The band completed two national tours to support - once in support of LACUNA COIL (also with BUTCHER BABIES), the other in support of the GEMINI SYNDROME tour mentioned above. The band is touring in support of their current single at radio, "The Damaged Ones". Don't miss them this coming Thursday night at Slidebar in Fullerton, CA with SKOLD (formerly of MARILYN MANSON). RED TIDE RISING recently completed a run of the upper midwest and Canada in support of SEVENDUST and CROBOT, and are touring in support of their EP Vices, which was released in May. Their current single is a cover of the TEARS FOR FEARS song "Mad World".